Discovery begins with introspection. Taking the time to go within and asking yourself "If I could do or be anything I wanted, what or who would I be?" It's a space of taking inventory while looking to adjust our perspective to gain a new vision and understanding. This leads to seeing life's possibilities. As we become clearer on what we think and believe we can see the options and choices to progressively make each step. Leading ultimately to understanding our purpose and passion in our world. Each step taken one at a time builds confidence, experience and success. Day to day we experience this thing called life. We may have a sense of the outline of the day but all the details that are in between have a way of filling themselves out. Our thoughts, our past experiences, our creativity and our future dreams intermingled with personality and emotions are the ingredients that are added to this daily entree. How can we prepare ourselves then to go with the flow, adjust the ingredients as needed and accept opportunities when they present themselves? Joining us this week is Dr. Barbara Young, who is living an extraordinary life, from the halls of academia to the stage and radio, teaching her program Transformation For Success. Today starts anew each day. Happy New Day! I was born and raised in Lawton, Oklahoma. With a military base close by and a transient population, things never really seemed to happen in this seemingly small hometown. I began to pay closer attention to my surroundings at and early age. With a copious amount of self prescribed solitude, I would spend time outside, far away from anyone. I tuned into the trees, the colors, the sounds and most importantly, the light. Seeing things from at least two perspectives would lead me to continue to create magnificent bodies of work that play with the mind and the eyes. Using Light as my main subject, I am able to illuminate the subtleties of life, death, color, contrast, texture and emotion. As I continue on my journey, I can only hope my work resonates with the viewer and compels he or she to slow down a little and turn inward. To view and purchase my work visit my gallery at curtisspeer.com. ​Have you ever dreamt about being an artist? Actor? Photographer? Writer? Are you someone who is known for having great ideas and easily brainstorming solutions to problems however you sometime struggle with putting your ideas into action or block yourself from your creative passions because of old mindsets or beliefs? When we create something new, when we allow ourselves the freedom of mind to cultivate a project, thought, or vision, we can unlock a deeper awareness of our expression in the world. Joining us this week is the brilliant photographer of Light, Curtis Speer. Curtis uses his awareness of Light and the things we seem to overlook in our day to breath new life into old ways of seeing. Are you ready to turn your creative mind into your dream creation?! Simran Singh - author, creative visionary, transformational catalyst, and Rebel Humanitarian - is Publisher of the Nautilus Award–Winning 11:11 Magazine, the only publication to have ever been granted this designation, and number-one rated, 11:11 Talk Radio show host. Having no interest in being teacher of Guru, Simran invites people to stand with her as ‘Examples of a New World Paradigms’. Author of Your Journey To Enlightenment and Conversations With The Universe, this Lead Rebel of The Rebel Road Tour, impacts thousands upon thousands with her message. Her passionate style takes individuals on a journey into courage, fearless authenticity, and presence through writing, speaking, creative expression and experience as the Rebel in her one-woman show, The Rebel Road: Connecting the Dots of What Was to What IS. by illustrating the bridge between dark and Light as our path of radiance and illumination. As we learn to embody and embrace fully who we are and the path we are on, we venture into sharing ourselves in a more intimate, vulnerable and clear way with those around us, leading to not only personal growth but also effecting change on a larger global scale. How then do we take these steps, venturing from a place of the old or well-worn path through the chaos of unlearning and new learning to find the creative forces that we hold within? How do we use the signs or ‘conversations with the universe’ to guide us on our journey? How do we live with more love, courage and commitment to embody the innocence of the child? And most importantly, how do we brave ALL that Love offers as a path of soul growth and self-realization? Joining us this week is the multi-talented Simran Singh, host of 11:11 Talk Radio. Together we will discuss the leap of faith that comes from moving out of our comfort zone and into full expression of who we are and how we show up in the world. At the age of 14, the young athlete lost the use of both legs after surgery on his knees went tragically awry. Retreating into his own private world of despair for nearly four years, Joe emerged ready to tame the shrew within himself. He tackled all opportunities through a series of goals that helped to rebuild both his self-confidence and self-esteem. Every path we take, whether planned or unplanned, leads us to new opportunities for growth. At times we see these detours as blocks or distractions from our goals and intentions when in fact they often lead us exactly where we are meant to be! Joining us this week is Joe La Salle, inspirational author, to share how he turned adversity into self discovery, insight and triumph. When we trust the path we are walking and are open and receptive to seeing the opportunities and lessons along the way, we emerge stronger and better prepared to welcome our truest dreams and desires. Discovering and uncovering the path we are meant to walk. In a weight loss industry that’s overly focused on stress and extremes, Coach Yari brings a refreshing and loving conversation about weight loss. An inspired innovator and a spiritual “SoulBody” teacher known for her amazing body transformations in a 14+ year career, offers The SoulBody Method ™- A freeing and soulful fitness approach that replaces the cookie cutter, depriving & restrictive traditional weight loss and body shaping programs WITHOUT calorie counting, harsh dieting or excessive exercise resulting in a faster body transformations that are actually sustainable. We have grown up hearing the phrase "You are what you eat" and the truth is, we are what we eat, think, believe, speak, surround ourselves with, etc. Our physical bodies are a reflection of both our decisions and our indecision. Taking care of our bodies and our health is a mindset unto itself and requires resetting and shifting in healthy and mindful ways. Joining us this week is special guest Yarixa Ferrao, aka Coach Yari, fitness guru and spiritual teacher. She will share with us her program called The SoulBody Method TM. We will explore the connection between the mind and the body and how we can step by step begin to shift old mindsets about health to new and vibrant ways of being. Start right where you are. It is time to reclaim your mindset around your health and body! One step at a time, one mindset reset at a time. You won't want to miss this special episode! Join Prudence and special guest Marsh Engle as they discuss stepping into creating your vision, recognizing that vision which is wanting to emerge through you, the process of receiving and recognizing the evolution of your grand vision, and how to let go of expectations of outcomes. The time has come to welcome in your GRAND vision of life! GO FOR IT! What do you want to see, feel, experience in your life? Do you have a vision for your life? The truth is we are creating a vision of our life subconsciously if we don't take the time to make it a conscious process. So what does it look like when we step into our senses to understand what it is we wish to create in our own lives. How long has it been since you had a day dream about your life? What do you think about? What is the scene or scenario that presents itself? Or do you stay so busy that you have forgotten how to dream? Joining us this week is Susan DuCharme, CEO of the H.E.R. organization to share her insights as not only a staff member but also as a fellow woman on the journey of self discovery. Have you ever experienced a weekend so powerful and transformative it has completely changed your life? Have you wondered if this was even possible, to take time out of your busy schedule and to do something this important for yourself? Welcome to the H.E.R. Weekend! It is an honor to share with you the powerful and important work that this community does in order to allow women a safe space to receive Healing, Empowerment and Release (H.E.R.). One of the unique treasures of this retreat is that it is staffed by both women and men, providing a safe and nurturing space to remove the masks that you wear and introspectively make choices about the life you desire to live. This week we welcome Patrina Wisdom, known as The Fresh Start Specialist, who dynamically shares her story of moving from Victim To Victor overcoming obstacles and trials with persistence and laughter to live a bodacious life! The Hero's Journey calls us to rise above our circumstances to boldly step into a grander expression of our lives. What does it take to be resilient when we sometimes get knocked down in life? Resiliency, the ability to become strong and grow after being pulled, stretched and bent in ways we never imagined. Upon reflection, we all can share a story of our Hero's Journey. A time when we have overcome some obstacle, trial or limiting belief to learn a deeper lesson about who we are as we climb up to a new way of being and find our footing as victors on our path. What would happen if you weren't afraid of making a mistake? Would you choose a different path in life? Would you make new choices and be bold in your actions? This week we are joined by Diane Musselman, creator and owner of Dancing Forward Productions. She will share with us her insights, challenges and life principles that have led her to leaving a 20+ year career as a speech pathologist in order to follow her uncharted path in the world of film writing, producing and acting. You hold the key to unlock the truth of who you are. The time has come to open the door! Joining the conversation is our guest Barry Selby, aka "The Love Doctor", and best selling author of the book "50 Ways to Love Your Lover". Whether you are in a successful relationship that can continue to grow, are looking to find common ground in one that is struggling, or searching for a new relationship, you can apply these elements which serve as a barometer to knowing you are giving and receiving in a healthy and harmonious way. If relationship means self-fulfillment through connection with others then how do you show up, how do they show up, and how do both sides connect to bring about harmony, compassion, communication, and growth. When applying the MindSet ReSet Formula for Relationships we explore the four elements to identify a common language and a common ground with the foundation being that of knowing oneself, what you want and who you are. When we are able to relate to ourselves, then we are best able to know who we are when we show up in relation to others. Living on purpose is more than finding your dream job or career. It's about finding who YOU ARE and who you are meant to be in your day to day life. Living on purpose is knowing that with each breathe, each decision, each achievement you make you get to show up as the authentic real YOU. This YOU is then out in the world and is seen via the things that you do and the people with which you are surrounding yourself. Are you living on purpose or are you living by default? Join us as we discuss with guest, Shirley Palmer, what does it take to make the decision to not only find your purpose but to live it and declare it with everything that you are. Family is the first exposure we have in our lives to the opinions, cues, values, information, experiences, and handed-down traditions that become our initial and most lasting influence on our mindset. We absorb beliefs and values like a sponge via osmosis because we are young and inexperienced and family is our whole existence. All mindsets can be reset but our first environment is a fertile one. This weeks show reflects on some mindset values we have carried from childhood and explores ways we can enhance this initial family environment that nurtures our mindset in childhood and throughout our lives. We will also discuss how to find who we are in the midst of the family roles we are placed in both by choice or by birth. Joining us is special guest Kim Pagano to share strategies to connecting with a growing family while staying true to who we are. On this episode we speak to listeners that call in for their own MindSet ReSet consultation. Obstacles cease to exist, insights are abundant and results are powerfully evident. Are you ready to let go of the things in life that are holding you back from your dreams? Are you ready to create new opportunities for yourself? Is it time to take a deeper look at what you want in life and begin to set your vision into motion? This episode we talk with guest Tiffany Goyer, Marriage and Family Therapist who will share with us her special program Find Your Flourish. We will dive further into the topic of leisure exploration and the importance of taking this time for you to stay connected with yourself. And Remember even nature itself takes a break from blooming! When was the last time you allowed yourself a true vacation? Do you ever tell yourself that you don’t deserve it, can’t afford it, or have to wait for it? And are you allowing yourself even daily relaxation time to recharge? R&R is a lot more than taking a vacation to get away from it all. R&R is a vital time to replenish and renew us, recharge our batteries, and reset our status quo. How do you take a break from your day-to-day life? On this show we will explore what happens When Science and Spirit Meet. These two seemingly different worlds that overlap in very dynamic and influential ways. You will learn how to use them both to make lasting changes in your life, overcome obstacles and create new opportunities along the way. What we know for certain is that the brain is a powerful tool. We know much more about the workings of the brain and it's abilities because of the cutting edge research by the scientific community. Neuroplasticity and epigenetics are becoming buzz words when studying the mind and its function, yet what does it mean? What we are also discovering is the power behind our thinking and beliefs and how they play out literally and figuratively in our brain, our mind, and our world. When we look through the lens via the spirit and essence of who we are, we learn the ability to impact the changing nature of our brains. There is nothing more personal then starting your own business and you can't take it personally. What does it take to step out on your own and put time, effort, money, and energy into your own business? What do you believe in enough to give it a try? And if you have a business already, what does it take to continue to grow and thrive with it? There is nothing more personal then starting your own business and you can't take it personally. What does it take to step out on your own and put time, effort, money, and energy into your own business? What do you believe in enough to give it a try? If you have a business already, what does it take to continue to grow and thrive with it? This weeks episode is about applying principles from the book MindSet ReSetTM: A Passage to Choice, guiding you through a journey of determination and introspection allowing you to decide which mindsets are working for you in your life and which old roads it is time to leave behind. 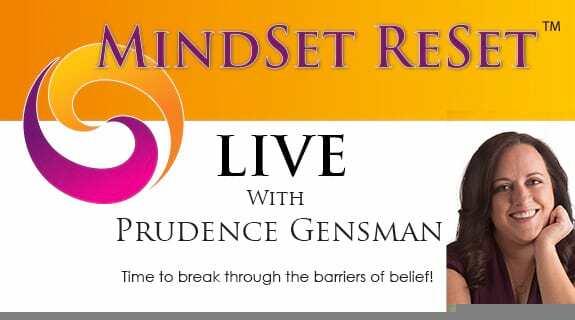 Listen to our calls from listeners as they are coached by Prudence using the MindSet ReSetTM Process. What does it take to decide to move away from our old ways of existing and thinking to brave stepping across the divide and learning about ourselves from the other side of the road? Is the grass greener, air sweeter, sun brighter? And can we make the choice to return to baseline if crossing this particular road turns out not to be where we want to roam? In this episode we are going to explore the world of genuine self care. How you do the little things and big things for yourself. The possibilities are endless as we look at everything from how you talk to yourself to sneaking in some quiet time in your day. We will also speak with special guest, Best Selling Author and voted Best Therapist in Western North Carolina, Dr. Shannon South, aka "The Joy Doctor", to discuss finding joy and empowerment in your every day. Remember: Self care isn't selfish it is self necessary! How often are you putting yourself last, behind your family, your work, your volunteering? When was the last time you said NO to someone's request for help? When was the last time you did something special just for you? Are you ready to break past this mindset and start saying YES to you? What Does Mean to Be Bold? Being BOLD means listening to your inner voice. Being BOLD means defining your choice. Being BOLD means making a move, even when your the only one that believes it matters. What does it take for you to make a decision and step out in life in a new way with or without support or applause? What does it look like to be bold in your life? What are you ready to declare and begin moving towards right here and right now? What in your life needs a MindSet Reset?